So there I was, poking around some of the more arcane settings on my Moto G, when I stumbled across something that took me aback: an archive of every voice command I'd ever spoken to my phone. Turns out that each time you say something to the Google Now search box, Android saves a copy of what you said in your "Voice & Audio" history. Your voice history can go back months or even years, and it includes a transcript of what you said plus a playback button, so you can relive the moment. That's not all. Your Android device—and, indeed, all your Google accounts, mobile or otherwise—can also save a "history" of your web searches and clicks, as well as what you've searched for and watched on YouTube. Android can also save a map of where you and your phone or tablet have been, even when you weren't actively using your handset. Creepy? Well, that depends on how paranoid you are. 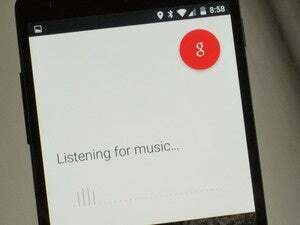 According to Google, saving your Android activity is the best way of generating search results that seem to be reading your mind, boosting the quality of its voice recognition, suggesting nearby restaurants where you may want to eat, and so on. Google swears up and down that you, and only you, have access to your Android history. 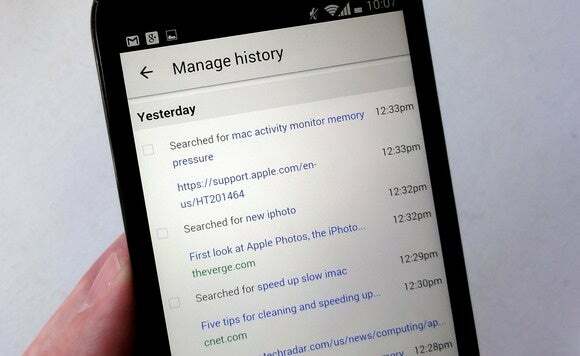 You can easily turn your web history off to prevent your Android device from tracking of all your Google searches. Every time you search the web using Chrome on your Android device—or using Google in a desktop browser, for that matter—Google takes note of what you searched for and which results you clicked. In addition to making your search results more relevant, your Google "web history" can make for a handy, fascinating, and/or creepy way of tracking what you've been searching on over the past days, weeks, months, and even years. Open the Applications drawer (typically, by tapping a button in the dock at the bottom of your Android home screen), tap the Google Settings icon (it looks like a gear), tap Account History, tap Web & App Activity, and finally tap the Manage History button. Voilà: your Google web history, in all its exhaustive glory. You can search your web history using the Search box at the top of the page, or you can delete individual items by checking the appropriate boxes and clicking the Remove Items button. To delete a big chunk of your web history—or all of it—tap the Settings button (the one shaped like a gear) just below the Search box, tap Remove Items, then choose how much to delete: the past hour's worth, a day, a week, a month, or absolutely everything. You can also put your entire Google web history on pause by unchecking the big On setting at the top of the main Web & App Activity screen. Doing so stops Google from saving your web searches and browsing until your turn the feature on again. Keep in mind, though, that your previously saved web activity will stay put until you manually delete it. 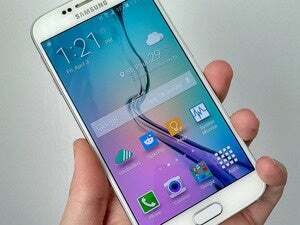 Another option is to pause your web history on a particular device, like your Android phone. To do so, tap the Data from this device setting on the main Web & App Activity screen, then uncheck the On for this device setting. Note: Another easy, albeit temporary way to keep Android from saving your searches is by turning on Chrome's private browsing feature. 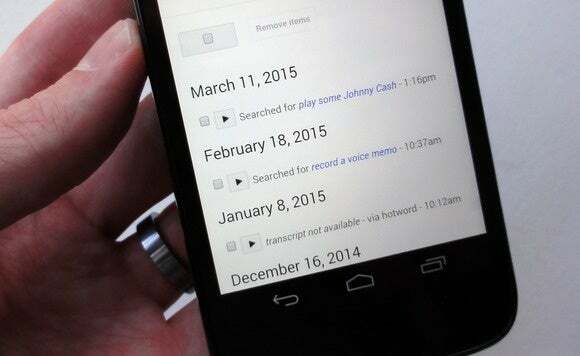 Your Android device tracks of all your voice commands. You can even hear what you said by tapping the little Play button. Your Android device keeps track of every voice command—anything from "What's the weather today?" to "Remind me to buy milk at the store." To see—and hear—a history of your voice commands, go back to the Account History screen in the Google Settings app. Tap Voice & Audio Activity, then tap Manage History. Scroll down to see a giant list of all the Android voice commands you've ever uttered. Just tap one of the little Play buttons to hear yourself saying each one. Interesting—and kind of weird. As with your web history, you're free to put your voice history on pause (permanently or otherwise), and you can also delete some or all of your saved voice activity. Tap the Settings button (shaped like a gear), then tap Remove Items. The choices are the same as they were for your web history: You can delete the past hour of your saved voice commands, the past day, a week, a month, or all of them. To pause your voice history, go back to the main Voice & Audio Activity screen, then uncheck the On setting at the top. Remember, though, that Android may become less adept at deciphering your commands with your voice history switched off. 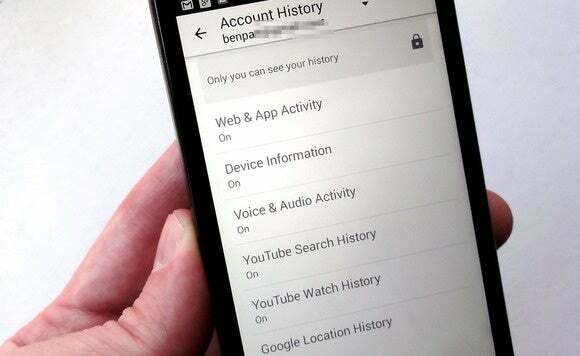 You can access your YouTube history, your web history, your voice activity, and more from the "Account History" screen in the Google Settings app. Your YouTube searches and plays are diligently saved in your YouTube history, all in the name of helping YouTube serve up better search results and recommended video clips. To keep YouTube from saving your searches from this moment on, tap the "Pause search history" button—and yes, you can always turn it back on later. To see the history of YouTube videos you've actually played: From your YouTube search history, tap the Watch History button near the top of the screen to switch to a list of your played YouTube videos. From here, you can view, delete, or pause your history of watched YouTube videos, just as you did with your YouTube search history. You can turn off "Location History" for some or all of your Android devices, so Android can't keep track of where you've been. Here's perhaps the creepiest way in which Android keeps track of what you're doing—or, in this case, where you've been. If you give Google the go-ahead, Android can keep tabs on the location of your various devices, periodically pinging Google's servers with the position of your Android phones and tablets—even when you're not actively using your devices. You can even pull up a map showing where (for example) your Android phone's been on any given day. So, what's the point of all this? According to Google, your "location history" helps apps like Google Now to be more prescient when it comes to, say, letting you know how long your commute is going to be, or which restaurants are on the way home, or what's playing at a nearby movie theater. To remove any of this history, go to the Account Activity screen in the Google Settings app. 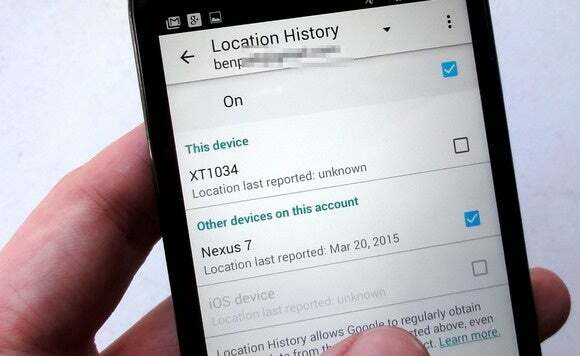 Tap Google Location History, then uncheck any or all of the devices whose location you don't want to be shared. You can also tap Delete Location History button to wipe your past location history clean. To see the map of where your various Android devices have been, tap the three-dot menu at the top of the Location History screen, then tap View/Manage. Note: Just because you've paused your Google web history or deleted your location history doesn't mean no one's monitoring your Android activity. 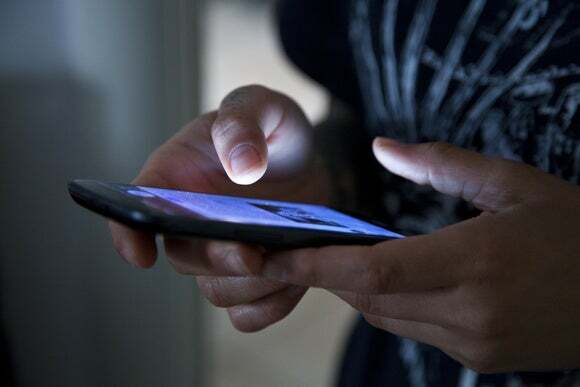 All your web site visits are duly recorded by your ISP, for example, while you wireless carrier can track "pings" from your Android phone on nearby cell towers.